The Klavern of Kolob an American secret society founded in 1838 is a real organization. 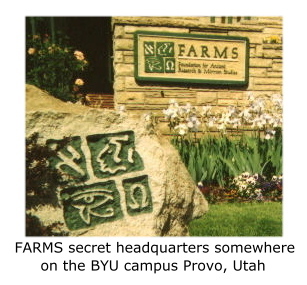 In 1986 a swing shift volunteer at Salt Lake's Genealogical Society, LaFern Verlette, discovered a cache of tea-stained and oven-seared parchments (each bearing the cryptic "MH" cipher) now known as "Les Documents de La Fern Verlette," identifying numerous members of the Klavern of Kolob, including William C. Bennett, Green Flake, Brigham Young, Jr., J. Golden Kimball, Gordon Jump, Verl Osmond and I.M.M. MaHonri. The 50 East North Temple C.O.B. prelature known as the "Strengthening The Members Committee" is an ultra-orthodox Mormon "CIA" that has been the topic of recent controversy due to reports of brainwashing, coercion, and a dangerous practice known as "cross-correlation." The Committee has just completed construction of a $47 million Mr. Mac's Superstore at 4747 South State Street in Murray. All descriptions of artwork, architecture, documents, artifacts and secret rituals in this novel are accurate within Packer UINCR (Uplifting If Not Completely Reliable) standards. Mormon Church President Thomas S. Monson staggered across the floor of the condominium's kitchenette, his Florsheims marking irregular, jagged streaks of black on the ordered speckle of the linoleum floor. He lunged for the nearest wall hanging he could see, an oversized print of the "Statement on the Family." Grabbing the plastic frame the eighty-one year old man heaved the "Statement" toward himself until it tore the small tack from the wall and he collapsed backward in a heap beneath the plexiglas. Monson lay for a moment, gasping for breath, taking stock. "I am still alive, Boyd." He crawled out from under the ponderous but yet surprisingly lightweight Statement and scanned the dimly-lit kitchenette for a place to hide. A still small voice spoke chillingly close. "Do not move." On his hands and knees, the newly-anointed sole owner of the Church of Jesus Christ of Latter Day Saints, a Corporation-Sole, froze. Only five feet away the frail silhouette of his attacker stared through the doorway, framed by the dim light from the hallway. His finger rested on the dial of the wall thermostat. An icy shiver ran up Monson's spine. The figure in the doorway was short and stooped, with ghost-like skin and thinning white hair. His irises were pink with dark red pupils. His white Swedish double-knit suit reflected a dull sheen in the half-light. He wore a white shirt (once it had been white), white tie, white socks, and white hush-puppies with white laces. Monson knew the uniform all too well. The matching skin was a new one though. The albino veil-worker began to push the dial on the thermostat lower. "You should not have run." His accent was not easy to place; but then, not many of the elderly veil-workers' accents were. "Now, tell me where it is." "I told you already," Monson good-naturedly spoke with a warm, boyish smile. "I have no idea what you are talking about." "This isn't Larry King Live," the albino shot back, "and you're no Gordon B. Hinckley. You and your brethren possess something that is not yours." Monson shivered with a surge of adrenaline (it WAS starting to get cold). "How could he possibly know?" thought Monson. "Tonight the rightful guardians will be restored. Tell me where it is hidden, and you will live." The albino menacingly fingered the thermostat. "Is it a secret you will die for?" Monson held up his hand in defense. "Wait," he said slowly. "I will reveal what you need to know." He spoke his next words carefully. The lie he told was one he had rehearsed many times. . . "As a young bishop I once visited the home of an elderly widow whose orphaned grandson got up at 3 a.m. each morning to deliver papers dragging a wagon that had no wheels. . ."
(No, wrong one. . .) He told another whopper, also rehearsed many times. . . each time praying he would never have to use it. His assailant smiled smugly. "Yes. That is exactly what the others told me." "I found them too," the frail man taunted. "Both of them. They confirmed what you have just said." "It cannot be!" Monson thought. Monson's secret identity, along with the secret identities of his two sacred sénéchaux, was secret and sacred, almost as sacred as the secret they secretly kept sacred. Monson now realized the others, following strict procedure, had told the same lie before their own deaths. The attacker lowered the thermostat dial further. "When you are gone, I will be the only one who knows the truth." The truth. In an instant Monson grasped the true horror of the situation. If I die the truth will be lost forever. The albino veil-worker glanced at the wall thermostat, looking almost amused. "My work here is done." He plunged the flesh-colored dial to its lowest setting. As a veteran of the trial studies of the disastrous Widow Watch Program, precursor to Home Teaching, Monson had witnessed this horribly drawn-out death before. For a half hour he would survive as his core body temperature dropped. Then unconsciousness and death. "Your skin is already looking paler," the albino said with a cold smile. Alone now, Thomas Monson knew that he had at most twenty minutes before the end. The fear that now gripped him was far greater than his own fear of death. I must find some way . . . He was trapped inside the condominium, and there existed only one person on earth to whom he could pass the torch. Monson gazed around at his opulent prison, furnished in faux-Celestial Room. A collection of LDS-themed prints, awards, statuettes, and Relief Society craft projects seemed to smile down on him like old friends. As the chill seeped into his bones, he summoned all of this faculties and strength. The desperate task before him, he knew, would require every remaining second of his life. Hamilton Pratt awoke with his heart in his mouth. Urgent knocking on the door shattered the darkness. He fumbled for the bedside lamp and turned it on. Squinting at his surroundings he saw a spartan bedroom with dark plywood furniture, a framed clown print, and short vinyl curtains drawn together above a noisy in-room heating unit. "Where the heck am I?" The ballpoint pen on the nightstand bore the name MOTEL 6 PROVO. Slowly, the fog began to lift. Another loud knock . "What is it???" he yelled. "Hello?" a woman's voice said. "You awake?" Dazed, Pratt looked at the bedside clock. It was 10:32 A.M. He had been asleep a long time, but he felt like the dead. There had been a lot of red punch. "Housekeeping," the woman's shrill voice intoned. Pratt still felt fuzzy. His eyes focused now on a crumpled flyer on the shag carpet. "Ok. . . that's right." He had lectured last night "a velcro board presentation about the recurrence of the salamander motif around pre-Colombian airfields." Some know-it-all in tight khakis, saddle shoes and a NuSkin windbreaker had wanted to argue about Pratt's last publication on Abrahamian Imagery in Ancient Egyptian Funereal Texts. Pratt had brilliantly defended his theory of obverse phraseology revealed by transpositioning common hieroglyphs. "What was this obsession with facts?" he thought. "Facts don't tell the whole story..."
Pratt was jolted from his reverie by another hard knock on the door. "Jeez! Can't they wait till I check out?" He moved toward the door, thinking now about the long, cold drive home to Rexburg. Leaving the security chain in place, Pratt opened the door a few inches. The face staring back at him was pudgy and dotted with acne. The young man was wearing a white shirt, nondescript tie, and a dark suit with a black plastic name tag stuck in the handkerchief pocket. Given he was in Provo, it didn't tell Pratt much. "I'm . . . with Church Security," the young man stammered. "May I come in?" "What's this all about?" Pratt asked, keeping the chain on the door. The young man reached in his right suit pocket and handed Pratt a photo through the half-opened door. When Pratt saw the photo, he went rigid. "Oh G--, sorry . . .," the young man blushed, snatching it back. "She'd freak if she knew anyone saw that." The young man pulled another photo out of his left suit pocket and handed it to Pratt. Pratt was stunned at what he saw. "Who would do this?" he said. "President Packer had hoped that you might help us answer that," the young man said. Pratt barely heard him. His eyes were still riveted on the picture. "This praying hands statuette here, that Order of the Silver Beaver medallion there, the replica widow's mites placed just so, and the way his body is so oddly . . ."
"Positioned?" the young man offered. Pratt nodded, feeling a chill as he looked up. "I can't imagine who would do this to someone." The young man looked grim. "You don't understand Brother Pratt. What you see in this photograph . . ." He paused. "President Monson did that to himself." One block away, the albino veil worker named Viktor shuffled through the front door of the Brigham Apartments, a seedy brownstone catering mostly to elderly temple workers that had seen its prime when “Ezra” was a fad name and the Leübner sisters on the second floor looked like extras from Baywatch. His pink eyes scanned the lobby as he entered the residence. Empty. He climbed the stairs quietly, not wanting to announce his return to the annoying sister who had pursued him relentlessly since his own dear Gretl had passed away forty-seven years ago. He slid the worn key silently into the lock of his apartment door and slowly turned it until he heard the barely audible click. “Vik--tor!” the melodious shriek of the elderly woman’s robust voice lilted down the hall like a pre-adolescent rottweiler in need of a stiff shot of ridilan. He quickly entered his small, one-bedroom apartment, shutting the door behind him and throwing the deadbolt into place. Breathing heavily he waited unmoving with his back against the door until he heard the heavy footfalls approach, stop, and then – thank God - retreat. For so many years the Lord had preserved him from marrying that Wagnerian nightmare. Tonight, at last, Viktor felt he had begun to repay this debt. Hurrying to the kitchenette, he picked up the receiver of the wall phone by the matching avocado refrigerator and range and dialed an unlisted number. "All three are gone. The two sénéchaux…and the grandmaster himself." There was a momentary pause. "Then…you have the information?" An excited breath. "Superb. I had feared the brotherhood's reputation for secrecy might prevail." Viktor knew the information he had wrung from his victims would come as a shock. "Teacher, all three confirmed the existence of the document…the legendary Fourth Facsimile." He heard a quick intake of breath over the phone and could feel the Teacher's excitement. “The Fourth Facsimile! Exactly as we suspected." According to lore, the brotherhood had come into possession of a hieroglyphic picture-puzzle interpreted by Joseph Smith from an ancient Egyptian papyrus scroll which the good citizens of Kirtland had purchased for him from a traveling exhibitionist of antiquities who had gone clear out of his way to stop at Kirtland, and who obviously hadn’t realized what he was parting with for a mere two thousand four hundred in 1835 hard dollars. The Fourth Facsimile reputedly contained a revelation so stunning that Joseph had kept it locked away and had not published it in the Book of Abraham translated from the remaining portion of the scroll. What was revealed on The Fourth Facsimile was the greatest secret of all…information so powerful that its protection was the reason for the brotherhood's very existence. "We must possess the Facsimile," the Teacher said. "Only when we have it safely locked away can we be sure that be sure that its contents will never be disclosed to those without eyes to see or ears to hear. Too much information can be a dangerous thing to the faithful." "We are closer than you think. It is here in Salt Lake." "Salt Lake? Incredible. It is almost too easy." Viktor relayed the earlier events of previous night…how all three of his victims, moments before death, had desperately tried to buy back their Godless lives by telling their secret. 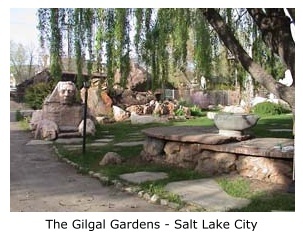 Each had told Viktor the exact same thing - that the Fourth Facsimile was ingeniously hidden at a precise location inside one of Salt Lake’s most kitschy sites – Gilgal Gardens. "How they mock us!" the Teacher exclaimed. "As they have since Nauvoo." Viktor knew the stakes were incalculable, and yet what the Teacher was now commanding seemed impossible. "But Gilgal Gardens, it is a strange place. Especially at night when the scent of baking Wonder Bread is strongest. How will I dare enter?" With the humble arrogance of a righteous man used to getting his way, the Teacher explained what was to be done. His stomach turned, but his spirit soared. A few hours, he told himself, grateful that the Teacher had given him time to carry out the necessary penance before embarking on such an errand from God. I must purge my soul of today's sins. The sins committed today had been Holy in purpose. Even so, Viktor knew, absolution required a sacrifice of humility and supreme selflessness. He unlocked the door and let her in. Helga . Ever-hopeful Virgin of the Twelfth Ward senior singles. Shield-maiden of Righteousness. She brushed by him (as the Titanic mostly brushed by the iceberg), and placed the hot baking pan and a plate on the small, round formica table and motioned for Viktor to be seated in front of it. Beaming, she dropped a huge slice of the strüdel on the plate, tucked a napkin under Viktor’s chin, and placed a fork in his hand. She clasped her hands eagerly to her ample breast, now just below where her waist would be, if she had a waist. Grasping the fork, he speared a steaming hunk of the burnt-but-still-surprisingly-doughy mass, made, no doubt, with ingredients culled straight from the Gourmet Dining section at the Bishop’s Storehouse, and raised it to his mouth – wincing as the sweetly acrid smell hit his nostrils. Taking the forkful into his mouth and chewing slowly, he savored the cleansing ritual of his nausea. This is wonderful, my dear Viktor whispered, repeating the sacred mantra of Brigham Young - the Teacher of all Teachers. Although President Young had a reputed thirty-four plural wives of which only four could do little more than boil water, he had cheerfully eaten every dish placed in front of him. His words were still whispered nightly by thousands of righteous husbands and boyfriends around the globe as they sat at the table and performed the sacred practice known as "epicurial mortification." Viktor turned his attention now to the fully uncooked middle of the slice staring up at him from the plate, a doughy mass of slimed apple slices containing an unusual number of seeds. The Discipline. Eager for the purifying effects of his own agony, Viktor said a quick, silent prayer. Then, again gripping the fork, he closed his eyes and shoveled it in. Again and again, he opened his mouth. Finally, he felt his intestines begin to cramp. Having lived all his life in southeastern Idaho, Harrison Pratt never ceased to be awed by the concentration of natural, cultural and architectural treasures that marked the journey from Provo northward to Salt Lake City. It wasn’t often he had the luxury of being chauffeured, and Pratt let himself relax deep into the gray velour of the Buick’s bench seat and take it in, struggling to pull his pant-legs back down while, as a historian, appreciating what surely must have been the inspiring event that led to the invention of velcro. As the young security guard gunned the car onto the freeway, they sped past the faux-windmill marking Trafalga, the riotous colors of its fixed sheet-metal sails discordant yet subtly cacophonous in the morning sunlight. To the west the grandeur and mass of the Geneva Steel slag mounds came into view, sloping gently down to the inert waters of Utah Lake, an immense saffron-tinged sheet of milky green spreading west to its far shore where lay scattered the cloistered communities of Eagle Mountain and Saratoga Springs; islands of prestige and privilege afloat in the lunar landscape that was once the Tintic Mining District. “Bucolic” Pratt thought to himself. It was a word that perfectly described the scene. Or sounded like it did. They sped northward on I-15 and he beheld the gleaming Mt. Timpanogos Temple, its unique and timeless Uto-neo-retro design mirroring the many gleaming and unique MLM corporate headquarters buildings that unexpectedly dotted the face of Utah Valley like a mild case of adult acne; a shining diamond set amidst lesser gems of clean-looking strip malls and hundred percent home-taught neighborhoods. On the left they passed the historic Lehi Roller Mills. Pratt thought it no coincidence a cinema classic such as “Footloose” chose this particular location to portray the warmth and non-judgmental intimacy of an open-minded, accepting American family and community. Still, as they drove onward Pratt could not get the photograph out of his mind. He had never seen anything like it: the shocking starkness; the deliberate message being sent – and the positioning of the body. Finally though, he willed himself to concentrate on the photograph of President Monson. 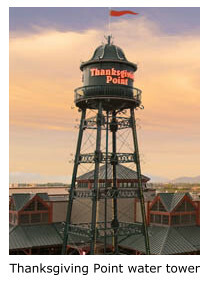 As they began to climb the long incline toward Point-Of-The-Mountain, the last uphill effort that would expel them out of Utah Valley like a baby pushed out of its mother’s protective womb, they passed the replica period water tower rising high above Thanksgiving Point. “Pretty awesome, huh?” the young driver said, looking over at Pratt. “I mounted ‘er three times,” the young man said, raising his eyebrows. They entered the Salt Lake Valley in silence; each absorbed in his own thoughts, each knowing that what lay ahead could well change the course of history, each wishing they had not got the 32 ounce Mountain Dew at the Krispy Kreme Shop on the way out of Provo. They passed the replica Ishtar Gate & Hanging Gardens of Babylon that doubled as the new Church Conference Center and made the right turn from North Temple onto State Street when it came into full view. 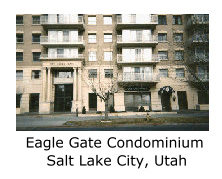 The Eagle Gate Condominiums. Pratt felt a familiar tinge of wonder as his eyes made a futile attempt to absorb the entire mass of the edifice. Across from the sprawling Church Office Building Plaza, the imposing facade of The Eagle Gate rose like a citadel against the Salt Lake sky. Shaped like an enormous beige shoebox, The Eagle Gate was the longest building on the east side of State Street between South Temple and 1st Avenue, stretching farther than five Brigham Young Monuments laid end to end. Not even the oddly located C-store on its street-level could diminish the majesty of the façade's phalanxes of double-paned thermal sliding doors opening onto stately astroturf-clad micro-balconies. Pratt had once walked The Eagle Gate’s entire perimeter, an astonishing three-minute journey. The driver stowed the device, turning now to Pratt. "You will meet Agent Smith of the L.F.P. in the lobby." Pratt gave the young driver an unknowing look. The driver ignored the signs prohibiting driving on the sidewalk, revved the engine, and gunned the Buick up over the curb. The driver pulled the car to a stop and pointed to the glass front door now one foot outside passenger-side of the Buick. "There is the entrance. Good luck, Brother Pratt." Pratt heaved a sigh and climbed out. It's your Road-Show. The young driver revved his engine and sped off. As Pratt stood alone and watched the departing “What do you know about Xango – Do you want to know more?” bumper-sticker, he realized he could easily reconsider, walk down to the corner of State and South Temple, cross the street, and ask for asylum in the Alta Club. Something told him if he didn’t want to be called to be Assistant Den Leader next Sunday it was probably a lousy idea. As he opened the glass door and walked into the lobby, Pratt had the uneasy sense he had just unwittingly said “yes” to just such a calling. Things were moving incredibly fast. An hour ago he had been asleep in a Motel 6 in Provo. Now he was standing in front of a large arrangement of plastic Birds of Paradise waiting to meet a special agent of the new Church security force – reporting directly to President Packer. On the lobby bulletin board he saw an A.A.R.P. flyer. I've fallen and I can’t get up, he thought. Out of an over-lit, mirrored elevator, a figure emerged, stopping once over the threshold to peer in both directions as the elevator doors silently closed behind him. The man was in his late forties, smudged double-bridge gold-rimmed glasses, five feet six inches, slightly overweight with thinning dishwater-blond hair combed over a violently receding hairline, could have been an accountant or a ward clerk – probably both. He advanced with a sense of nascent authority on short, under-exercised legs. He was speaking on his cell phone but abruptly finished the call as their eyes met. He motioned for Pratt to approach him. "I think you know who I am," he announced as Pratt covered the ten feet across the lobby. "Agent Brother Smith of the L.F.P." His tone was fitting – an injured whine…like a gathering swarm of mosquitoes. Pratt held out his hand to shake. "Hamilton Pratt." Smith's diminutive palm met Pratt's with moist bravado. "I saw the photo," Pratt said. "The driver said President Monson himself did-"
"Brother Pratt," Smith's watery eyes locked on. "What you saw in the photo is only the beginning of what President Monson did." Is the book finished? - 05/01/2008 - john p Editor's note: We hope not as we anxiously await the next installment. 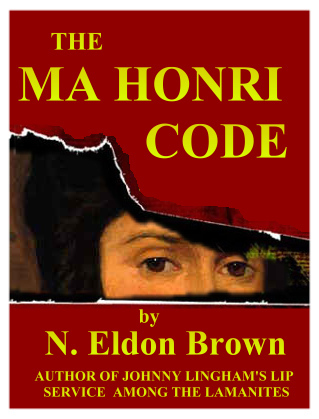 It's a spoof, based on Brown's DaVinci Code. It's wonderfully written, funny as hell. I can hardly wait for the next installment. I hope the author - who is obviously a very talented writer - doesn't get tired and quit.